With the theme of "Embracing What Is," the retreat in September was graced by the hospitality of the sisters at the St. Raphaela Retreat Center, by the open- heartedness of the 26 retreatants, and by the grounding provided by the leadership of Linda Chidsey and Carolyn Moon. Carolyn invited us into lectio divina using one the following passages from scripture. SotS has now established two committees to discern way forward with future programming. One is focused on a call to expand Silent Retreats offerings; the other is seeking openings for programs in the midwest. Thirty months ago SotS commenced its first intentional fundraising effort ever. We began with a goal of $210,000; this goal is now $250,000. The effort is closing this month with a $10,000 matching challenge. We have just $2,000 to meet the challenge and to surpass our goal! Many thanks to everyone for their support. Please consider a donation to help us meet the challenge. If you have an item you would like considered for the Winter 2011-12 newsletter, please make your submission to the by Jan. 30. Thanks. Please note that the appearance of this newsletter will vary according to the settings of your web browser. Our experience is that when we still ourselves from outward motion, from outward words and from inner thoughts, that we become aware that there is a Divine conversation already happening and that we participate in that conversation. Whether we understand that conversation as coming from God or coming from Jesus or coming from the Holy Spirit is not a point of doctrine. It is Divine, we know the voice, and we can trust the voice. It is not a proclamation, but is a conversation?so we can participate in it in both directionss. But for me, the amazing blessing is that I never have to settle into silence and get God�s attention, it�s already happening. In this issue of SnapShots, Friends explore that conversation through the images of the stream and of a thread as told through a fable, a quilt, photographs, and music. Please hold the School of the Spirit Ministry over the coming months as we gather the next class for the Spiritual Nurturer program (who in your midst is already at the stream's bank and wanting to step in?) and as we test the presence of a thread to expand the silent retreat offerings and to extend programming into the mid-west. May we know the stream of living waters. Judy is a graduate of the eighth Spiritual Nurturer class which ended in May of this year. She is a member of Chapel Hill (NC) Monthly Meeting. There are times when an image catches hold of you and becomes a recurring way to relate what is happening to you to something larger than yourself. When I was a child, I read and re-read George MacDonald�s extended fairy tale, The Princess and the Goblin. I find now that an image from that book, related to thread, has attached itself both to my love of working with thread and yearn in many forms and to my more recent employment of walking of labyrinth. In the book, the thread is fine and smooth, but in my mind�s eye, it has always been a little thicker and roughly textured so that it had a strong tactile quality. I have always been able to imagine how it would feel against my finger. I also thought it was interesting that in my mind, the location of the thread shifted from one hand and one finger to the other hand and a different finger. To me, the index finger of one�s right hand is associated with thought and activity. It�s not called the �pointer finger� for nothing. So, to have kept that finger on the thread seems to me to focus on rational thought and makes the task easier, because that finger is so involved in complicated, difficult activity that staying on the thread would be relatively easy. By contrast, the third finger of the left hand is probably the weakest because it isn�t used for almost any skilled activity. And having the thread connected to heart, rather than head, stresses to me the strong aspect of trust, emotional trust, implicit in letting a thin, almost invisible thread guide your steps through danger. As I look back at my life, I realize that both focus and losing focus are true for me. On the one hand, as I look back, I realize that I have been actively trying to follow a spiritual path for as long as I can remember. I asked to go to Sunday school, I resisted in attending throughout childhood and my teen years. I let go of Meeting during college but continued to read spiritual authors, particularly C.S. Lewis, and I resumed contact with the Meeting as a young mother and have actively sought out small groups of fellow seekers more and more as time went on. So in one sense, I have kept my finger on the thread and followed it, even though I didn�t know where I was going, or even where I hoped I was going. In another sense, my focus on that journey has been more and less intense, depending on what else was going on. I sense strongly that at times I have let go or at least stopped paying attention when a more active, present search might have had more significant results. For a musical depiction of a stream, listen to Franz Schubert's setting of Wilhelm M�ller's poem "Whither?" from his cycle Die Sch�ne M�llerin ("The Beautiful Maid of the Mill"), here beautifully performed by Ian Bostridge and Mitsuko Uchida. gushing down into the valley, so fresh and wonderfully clear. but I couldn�t resist following it right down with my walking stick. and always brisker and always clearer the brook gushed. Is this the way I am to go, Tell me, brooklet, whither? You have, with your gushing, enchanted my very soul. What I am saying about gushing? Gushing it cannot be! The Spirits are singing and dancing down there. Sing on, Friend, gush on, and go your happy way! There are mill-wheels turning in every clear stream. 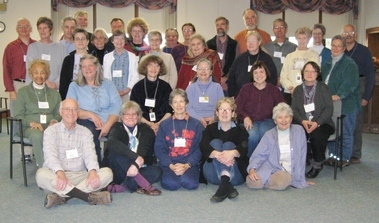 Lisa (front right) is a graduate of the eighth Spiritual Nurturer class and a member of Salem Friends Meeting in Winston Salem, NC. A koan came to me: Where is the heart of the stream? Where is the Center, which some would call God? Everything changes around us, and we change as well, but that Center is always present. This image of the heart of the Stream has been helpful to me in prayer as I try to center down but find extraneous thoughts popping up, I picture those thoughts as bubbles that rise to the water's surface and become foam and float away. But the heart of the Stream is always there, even though I don't always dive deeply enough to reach it. "Flowing" has also had meaning in my own family: my husband and I used to say that our "favorite four-letter 'F' word" was FLOW (we even had a hand signal for it). Living int he flow, surrendering to where life will take you, allowing the Spirit to flow within you . . . Where is the heart of the stream? Do you know anyone yearning to listen and respond to God more faithfully? Might the Spiritual Nurturer program be a suitable next step on their deepening journey with God, then please point them toward the program and invite them to meet the core teachers at any of the following events in the new year. Online registration is now possible on our new website. There is a small fee for these retreats. You can also direct them to the program's prospectus, which will give them deeper insight into the program. For the class starting in September, 2012, the application deadline is May 25. Remember that there is scholarship assistance available and we celebrate its use. Friends from the first Spiritual Nurturer class to the eighth class, from the early Contemplative Living and Prayer program to the recent The Way of Ministry, were present at the biannual Spiritual Renewal Retreat held last month at the Franciscan Spiritual Center. All were fed by Lloyd Lee Wilson's guidance through Jeremiah's lament, exploring the covenant triangle of God, the prophet, and the faith community. We hope to bring you more of Lloyd Lee's sharing in future issues of SnapShots. 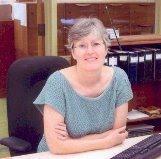 Jan Blodgett is a graduate of the seventh class of the On Being a Spiritual Nurturer program. She is currently the clerk of Davidson (NC) Friends Meeting and serves as a Piedmont Friends Fellowship representative to FGC's Central Committee where she serves on the Committee for Nurturing Ministry. She has been part of FGC consultations for yearly meeting clerks and her deep interest in spiritual retreats led to her new assignment of clerking the SotS committee on visioning Silent Retreats. Tom is a graduate of the sixth Spiritual Nurturer class in 2006 and is a member of Brooklyn Friends Meeting. Picture five Brooklyn Friends School (BFS) students around a table discussing the meaning of �simplicity� as a principle for engaging in life. Also present were Anne Pomeroy (Spiritual Nurturer program graduate, 7th class) and Jim Morgan, clerk of Brooklyn (NY) Monthly Meeting. This was a recent session of the BFS seminar I am leading called Encountering Quaker Testimonies. The concept behind this seminar is the creation of opportunities for Brooklyn Friends School upper school students to engage with Quakers whose lives embody these testimonies. As we come to the halfway point, seminar students are already recognizing that the �testimonies� they may have learned to rattle off in a list according to an acronym have roots and meaning deeply related to these Friends' Quaker faith and practice, so much more than just outward words or even actions. This has led the students to become interested in Quaker history: How and why did a particular testimony arise, become named? Why did Quakers come to consider this testimony important? It has led to the exploration of Quaker process for discernment, in the meeting for worship with concern for business as well as in settings such as committees for clearness. I see further opportunity in this seminar as well, in serving as a new way for one Quaker school and the wider Quaker world to become more directly and strongly connected. Have a Snapshot? Please send your submission with a photo of yourself. serves the Religious Society of Friends throughout North America and is under the care of the Worship and Care Committee of Philadelphia Yearly Meeting. Your contribution will help us deliver our programs and provide them to Friends from all economic levels. Please write your check to Philadelphia Yearly Meeting, earmarked for the School of the Spirit, and mail to the address below. Many thanks!